Football Star is an online slots game by Microgaming. 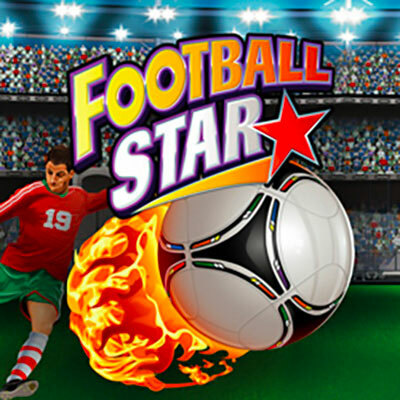 It is not only football themed with great graphics, it is mighty generous with its bonuses and features. They entail: Wild and Striking Wilds, Rolling Reels, and Scatters! Football Star has 5 reels, 3 row, and 243 ways to win. The online casino slots game has a minimum bet of £0.50 and a maximum bet of £50. It also has a jackpot feature which holds up to 250x winning stake. It’s no secret that Football Star is a Football themed online casino slots game. What may be a secret, is the fact that it’s full of bonuses, surprises, and good old-fashion fun! This game strives to do it all with it’s fancy Striking Wilds which converts reel full of symbols to Wilds, Rolling Reels that significantly increase your chances of winning, and Scatters that provide you with a growing number of Free Spins – up to 25! The slots game is well designed, fast-paced, and very entertaining. Below is an outline of some of its bonuses and features. The game’s logo represents the Wild symbol in the base game. The Wild can be used to substitute any symbol with the exception of Scatter in the slots game to form a winning combination. This feature causes the symbols that participated in a winning combination to disappear and make room for more symbols in their place. The brilliance of this is that it all takes place within the same Spin which means if the right symbols fall into place, yet another winning combination can be formed! The symbol with the Ball and the word ‘Scatter’ written across it represents the Scatter in this online slots game. When 3 or more of these Scatters appear on the reels, the Free Spins round is triggered! When 3 or more Scatters appear in the base game, the Free Spins Round in triggered. The number of Free Spins you get directly correspond to the number of Scatters you land. This is a random bonus that appears in the Free Spins game. Upon its appearance, an entire reel will be converted to a Wild. Meaning the whole reel can be used as a substitute for other symbols. It is almost like scoring a winning goal in the Fifa Cup. And aptly enough, the game celebrates your achievement with a long knee-grass slide across the field. Football Star is well animated, big on the bonus and enthusiasm, and doesn’t make you feel guilty for spending your time in front of a screen. After all ‘The Secret’ proved that if your mind really feels like it’s exercising, the body muscles follow suit. And with graphics like this, you’re well on your way to losing those pesky calories.